Grey, Julius H. and John Gill. "Canadian Citizenship". The Canadian Encyclopedia, 13 March 2019, Historica Canada. https://www.thecanadianencyclopedia.ca/en/article/citizenship. Accessed 25 April 2019. Canadian citizenship was first created in 1947 by the Canadian Citizenship Act. Today's version of the law says both Canadian-born and naturalized citizens are equally entitled to the rights of a citizen, and subject to the duties of a citizen. In 2014, the Strengthening Canadian Citizenship Act brought about the first significant amendments to the Citizenship Act since 1977. However, these changes were repealed or amended by legislation passed in 2017. Before 1947, both people born in Canada and naturalized immigrants (newcomers who became Canadian) were considered British subjects. 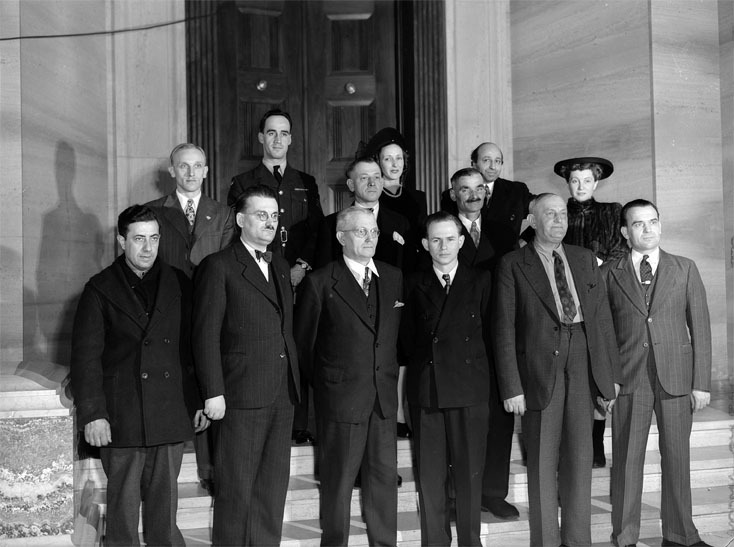 The Canadian Citizenship Act came into force on 1 January 1947 and was the first nationality law to define people as Canadian. The creation of Canadian citizenship was an important expression of the country's growing sense of national identity. The Act outlined the process and requirements for obtaining Canadian citizenship, as well as the reasons it could be revoked. Among other things, it gave married women full control over their nationality status; prior to 1947, a woman's nationality status in Canada was generally defined by that of her husband, and could be lost through marriage. The 1977 Citizenship Act (which received royal assent in 1976) came into force on 15 February 1977. Most provisions of the Act still apply today. It defines "citizen" as "a Canadian citizen" and provides that both native-born and naturalized citizens are equally entitled to all the rights of a citizen, and subject to all the duties of a citizen. These rights and duties are governed by provincial and federal laws and the Constitution Act, 1982. Citizens are guaranteed democratic rights, including the right to vote in elections of the House of Commons and legislative assemblies, and the right to run for office. The new Act removed the previous distinction between British subjects and “aliens.” This was an important change for Canada’s non-British population, which grew quickly in the decades after the Second World War. Many new immigrants from Europe and elsewhere had become frustrated with the unequal treatment they received compared to those coming from Britain and the Commonwealth. In response to this, the Act made all people seeking to become citizens equal. The Act also allowed Canadians to hold dual citizenship, whereas previously they would generally lose their citizenship automatically if they acquired the citizenship of another country. Under the Act today, all persons born in Canada are Canadian citizens at birth, with minor exceptions (e.g., children of diplomats). Generally speaking, children born outside Canada are automatically citizens if either parent was a citizen at the time of the child's birth, except if that parent was also born outside Canada. Adults who have immigrated to Canada are eligible to become citizens if they have permanent resident status, have lived for a certain number of years in Canada, have adequate knowledge of French or English, have adequate knowledge of Canada, and fulfill certain other conditions. Children under 18 whose parent or parents have become citizens — or who are applying for citizenship simultaneously — are also eligible to become citizens, if they are permanent residents, and if their parent or parents apply for citizenship on their behalf. The minister of citizenship and immigration holds discretionary powers in this area. These include the power to waive certain citizenship requirements, and the power to grant citizenship to any person to assist in cases of special and unusual hardship, or to reward services that are exceptionally valuable to Canada. Citizenship can also be revoked under these powers if obtained by fraud, misrepresentation, or "knowingly concealing material circumstances." Canadian citizens have the absolute right to leave and enter Canada (e.g., returning from travelling abroad) and the right to live in Canada. Indigenous people registered under the Indian Act	also have the right to enter and remain in Canada. Permanent residents and convention refugees are allowed some of these rights in Canada, but they face certain restrictions. For example, only Canadian citizens are eligible to obtain Canadian passports, although permanent residents and refugees can be issued travel documents (see Immigration Policy). Under the Conservative government of Stephen Harper, several important changes were made to the Citizenship Act. Amendments to the Citizenship Act in 2014 were the first since 1977 to significantly alter the Act, but important changes also came into force in 2009. The 2009 amendments dealt with a group of residents known as the “lost Canadians.” The term refers to people who were never granted Canadian citizenship, or ceased to be citizens, due to outdated legislation, despite a substantial connection to Canada (e.g. a person who took the citizenship of another country before dual citizenship was introduced in 1977). On 19 June 2014, a set of amendments to the law — called the Strengthening Canadian Citizenship Act — received royal assent. The goals of the amendments included dealing with the modern issue of terrorism, clarifying the definition of residence in Canada, and streamlining the citizenship process. The 2014 changes made it tougher to obtain citizenship. The amendments increased the residence requirement for citizenship applicants from three out of four years to four out of six years. In addition, time spent in Canada before getting permanent resident status no longer counted toward the residency requirement. Applicants’ criminal histories (e.g., certain offences committed outside of Canada) also came under more scrutiny. Prior to these amendments, a citizenship application was initially considered by a citizenship judge. Under the new law, citizenship judges no longer had any role in approving citizenship applications, except in cases where residency requirements are in question and the main role of judges was to administer the oath of citizenship to new Canadians. Applications would mainly be approved by government departmental officers. The 2014 amendments to the Citizenship Act also greatly expanded the reasons that a person’s citizenship could be revoked. Under the 1977 Act, the only grounds for revocation were fraud or misrepresentation on a citizenship or immigration application. Under the 2014 amendments, Canadian citizenship could be revoked based on criminal convictions related to security matters committed in Canada and abroad. Examples of such convictions include terrorism, violation of human rights, war crimes and organized crime. Citizenship could also be revoked if an individual served as a member of an armed force in an armed conflict against Canada. According to the 2014 amendments, the minister of citizenship and immigration had the direct power to revoke citizenship in cases of fraud. The minister would refer the decision to revoke an individual’s citizenship to the Federal Court	only in cases that related to security matters (such as terrorism), human rights violations or war crimes, and organized criminality. Revocation of citizenship did not return the person to the status of a permanent resident, but rendered them a foreign national with no right to reside in Canada; they could then be deported. Applicants could apply for judicial review of a decision made on their case, but the grounds to do so were very narrow. In June 2014, a group of lawyers including Rocco Galati, Manuel Azevedo and the Constitutional Rights Centre launched a court challenge of the Strengthening Canadian Citizenship Act, calling it unconstitutional. Critics also said that the loss of flexibility in the amended law will make people with strong connections to Canada ineligible for citizenship — and that this might affect Canada’s ability to attract skilled and desirable immigrants in the future. In June 2017, Parliament voted in new legislation concerning citizenship. Bill C-6 repealed or amended the changes introduced in 2014 through the Strengthening Canadian Citizenship Act. This included repealing the revocation of citizenship based on national security concerns. Under the new legislation, therefore, dual citizens who had been convicted of terrorism, spying or treason or who had been part of an armed force engaged in conflict with Canada would no longer lose their citizenship. The legislation also created a new process for revocation. All cases of revocation would be decided by the Federal Court, unless the individual in question requested their case be heard by the minister of citizenship and immigration. The residency requirement was also reduced from four out of six years to three out of five years. Moreover, applicants could once again count time spent in Canada before becoming a permanent resident as part of their residency requirement. Other changes made it easier for minors to become citizens. Non-citizens in Canada do not enjoy political rights such as voting and running for office, but generally have all legal rights and are subject to the law in the same way as citizens. Non-citizens include refugees, permanent residents, international students, foreign workers, and visitors. Permanent residents are entitled to work in Canada, while visitors usually are not. Citizens enjoy many rights in Canada, including the freedom to live or work anywhere in the country, the right to fair trial and the right to vote in elections. But citizenship also comes with responsibilities. For example, voting in federal, provincial and local elections is not only a right, but also a responsibility. Canadians are expected to take an active role in the community — this is known as “active citizenship.” This includes not only voting but also volunteering (e.g., at schools, food banks and other charities) and protecting the environment (e.g., recycling, helping clean up polluted areas). Ninette Kelley, The Making of the Mosaic : a History of Canadian Immigration Policy (2010); Valerie Knowles, Forging Our Legacy: Canadian Citizenship and Immigration, 1900–1977 (2000); Valerie Knowles, Strangers at Our Gates : Canadian Immigration and Immigration Policy, 1540-2006 (2007).